There are many ways to manage stress. Naturally, some of the most appealing choices involve lying on white sandy beaches, and soaking in a warm bath. However, brushing up on your planning skills may be the more effective route. A recent international survey by Harvard psychologist Robert Epstein confirmed that planning was the single most powerful method for reducing stress because it prevents tensions from building up in the first place. If you want to be more proactive about creating greater peace and calm, start running down this checklist. Take control. Stress often comes from feeling like events are beyond your control. Planning reminds you that it’s your decision how to respond to what happens. Be prepared. Knowing what your day or month looks like in advance can prevent unpleasant surprises. You’re less likely to discover that you’re attending a wedding the same weekend that you have overnight guests. Protect your health. Stress contributes to many serious health issues, including obesity, diabetes, and heart conditions. Decompressing, exercise and eating nutritionally dense foods could even help you live longer. Overcome procrastination. You’re more likely to complete projects when you break them down into smaller steps with their own intermediate deadlines. Being clear about what you need to do increases your motivation and your chances for success. Feel more fulfilled. Planning helps you to distinguish between what’s urgent and what’s important. The quality of your life soars as you devote more time to meaningful activities. Track your time. The first step is to figure out where your time is currently going. Keep a diary or use a free app for at least a few weeks. You may be surprised by how long some simple tasks really take. Structure your activities. Once you understand your typical day, you can make adjustments. Maybe you can switch more demanding projects to the hours when you’re at your peak. Maybe you can squeeze in the workout program you’ve been promising yourself. Organize your stuff. Clutter bombards your senses and causes anxiety. Pare down your possessions. Buy attractive storage solutions for your home and office. Write things down. Do you have trouble concentrating because you’re trying to remember when your daughter’s soccer practice starts, and whether you have enough eggs for breakfast? Put those items into calendars and lists so you can focus on other things. Set priorities. There’s more to planning than completing tasks. Think about your values and goals. Ensure any system you use gives you the ultimate results you’re seeking, whether that’s spending more time with your family or adopting a healthier lifestyle. Manage your commitments. 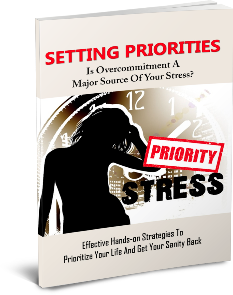 You may find that you need to strike some items off your to-do list if you tend to take on too many obligations. Respecting your limits will actually make you more accomplished and dependable. Establish routines. When you make an activity automatic, you operate more efficiently and cut out the stress involved in making extra decisions. Group similar errands and tasks together so you can do them with less thought. Resolve to go running before breakfast each morning instead of going through a daily struggle to resist the snooze button. Schedule downtime. Planning has its fun side too. Give yourself frequent breaks to refresh your body and mind. Ensure your lists and calendars include opportunities for play and laughter. Stress management and time management are closely related, and planning is the key to using your time well. To become more relaxed and productive, think positive and plan ahead.